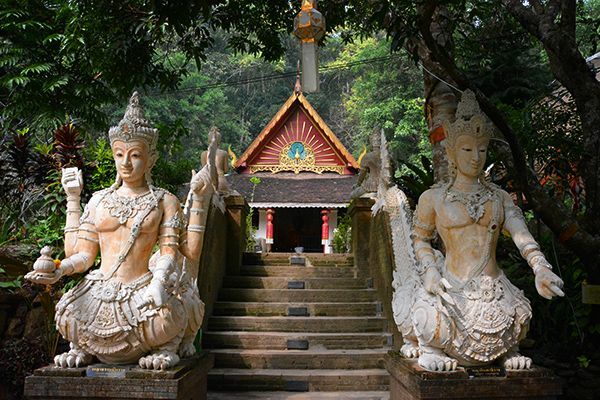 HomeChiang MaiHiking Through the Monk's Trail to Visit the Lovely Wat Pha Lat Temple! Doi Suthep is the most famous temple and among the most beautiful in Chiang Mai! But Wat Pha Lat, while smaller and less famous, has many interesting architecture and sculptures such as the Buddha's statue and pagoda! What a lovely atmosphere! We've arrived at the starting point to begin hiking! Arrive at Wat Pha Lat Temple! Enjoy the scenery which is full of statues, only accessible by a hike! Time to enjoy this authentic experience! Let's hike our way back to parking lot! Time to have lunch at a local food shop. Here, you can sample some of the most authentic Thai dishes! If you don't know what to eat, ask me! We should be dropping you off at your hotel in Chiang Mai city! I hope you enjoyed the trip! but Wat Pha Lat, while smaller and less famous, has many interesting architecture of buddha statue and pagoda.